This morning we awoke, had our previously - described breakfast, ( The local lunatic was muttering to himself, chatting with a couple from Rochester, N.Y., and hitting a chair with his walking stick) and went to Woolworth's supermarket. Then we walked thru the town, where the church bells were pealing for about 1/2 hour straight - must have been a funeral or something. Walked thru a park - then hit the road to Neuschwanstein. We arrived just before most of the other tourists and hiked 25 minutes up a steep mountain to the castle. After catching our breath, we took the tour (in German) but accompanied by our guidebook. 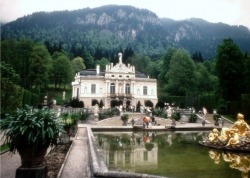 The castle, like the others we visited today, was built by "Mad" King Ludwig II in the second half of the 19th century. It was his version of an ancient knights' castle and very Walt Disney-ish. The interior displays amazing craftsmanship; it is unfortunate that Ludwig died before it was completed. We then walked about 1 1/2 miles to Neuschwanstein's sister castle Hohenschwangau - where Ludwig grew up. The castle was much more homey - overlooking a garden and a lake. Nice fountains. Then south - to Austria! We were waved through the border crossing and had a picnic lunch in our car (temp about 60-65). Then proceeded back into Germany (another wave-through) to Garmish Partenkirchen. The whole drive was potentially beautiful, through high alpine meadows and our first glimpse of the Alps. Unfortunately it began to rain and the cloud cover was heavy. It was pouring by the time we got to Garmish-Partenkirchen, so we decided to tour another of Ludwig's castles - Linderhoff. Just as we got to the area - the rain stopped! The castle's interior is an example of the worst excesses of the Rococo style - frills and gold. Looks like a Staten Island Italian's dream of riches! By this time we were quite tired, so we stopped in the town of Ettal at the Hotel Ludwig Der Bayer. Ettal is famed for its dark beer brewed by monks - one of which we had (so far.) The waitress also convinced us to have 2 liqueurs brewed by the monks - very different and not bad. It really hit the spot after a strenuous day. I am now sitting in front of the window overlooking the monastery; unfortunately it is raining again. Hope it clears up by tomorrow. Tonight we'll probably have dinner in the hotel and turn in early.